Maggie Brinklow and Tony Killen, a husband and wife team. As well as being a funeral director, Maggie is also a trained funeral celebrant – and it was while working as a celebrant and as an arranger for another firm of funeral directors that she decided to go the whole way and become a funeral director in her own right. She was supported in this by Tony, but he found himself so drawn to the work that he evolved from being a background presence, mostly as a handiman (he is an engineer by training and worked for many years in a senior role in IT) to becoming involved in all areas of the operation. When not working, Tony enjoys DIY, fishing and reading; Maggie enjoys card crafts. This is a relatively new business, which opened in 2010. It is always a brave decision to set yourself up in business as a funeral director, and it is testimony to Maggie and Tony’s passion and strong sense of vocation that they made this commitment. You’ll find them warm, kind and down to earth – they have that all-too-rare one-of-us quality. This is a very down-to-earth, very professional business, unencumbered by tradition and rigid ways of doing things. Maggie and Tony simply meet you where you are and take it from there. They will give you exactly the funeral you want — nothing’s too much trouble. Most of the funerals they are asked to arrange are traditional, and they carry these off very smartly indeed. But they are very open minded and they will arrange any sort of funeral you want. They are perfectly happy to dress down and use their estate car as a hearse. You call the shots and they will very happily do what you want. You come first. It is normally Tony who conducts the funeral on the day and makes sure everything runs smoothly, never in a bossy, self-important way, but very capably. We reckon this is a particular strength. It doesn’t matter what your budget is, you will receive the same excellent treatment as everybody else. If your budget is especially tight they will help you with your application to the social fund and help you create a really special send-off which doesn’t break the bank. They like to encourage family members to carry the coffin, a really special way of participating in the funeral as well as saving you £45 per professional bearer. The Finedon premises are in a former draper’s shop in a lovely 19th century building, with heaps of space for you to come in and decorate the coffin if you want. Having expanded to the whole ground floor of the premises, they have now created a space where the ceremony can be held if you want, and indeed a reception following the ceremony. The coffin can remain in place, giving family and friends the chance to spend time either with guests or with the person who has died. Margaret Rose have an arrangement with the nearby church to use the car park on these occasions. Very lovely chapel of rest. The Corby branch is in the old baker’s shop, where local people used to come in daily to collect the freshly baked bread and rolls. All the original red floor tiles remain in place, and the building has a warm feeling of a place that has been used and loved for many years. Tony used his skills to fit it out to provide a private arranging room, a chapel of rest and a mortuary space at the rear, with refrigerated space to care for up to nine people at a time. The branch is looked after by Jemma, when she’s not there the phones are answered by Maggie or Tony at Finedon, and they will either come straight over to meet you, or arrange a time to come to your home or meet at the branch. As it will be Tony who will look after you on the day of the funeral, he will ensure you meet with him beforehand. There’s a breath-of-fresh-air quality to Margaret Rose. Perhaps the keyword here is openness, from the spacious, light-filled premises – no gloom here – to the open minds of Maggie and Tony. Because they are relative newcomers to funeral directing, they are less influenced by notions of ‘how it should be done’ than by notions of how it can and ought to be done really well, just as their clients want it. Every funeral for them is new and different. No client is ever just another client. There’s something rather liberating about this. When we visited in 2017, we were struck by the various floral letters and words hanging on the walls in Finedon. Create by a local florist from artificial flowers, these are offered to clients without charge, allowing ‘Mum’, ‘Nan’, Grandad’ etc and any combination of letters to make up a name to be displayed in the hearse alongside the coffin. There is also a coffin spray that can be borrowed if money is tight. We loved this idea. 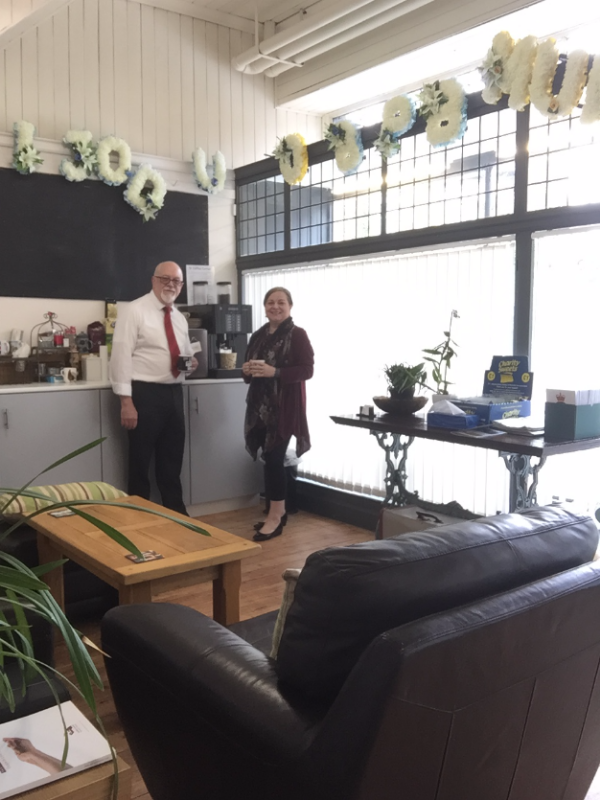 We haven’t come across it anywhere else, and it is typical of the thoughtfulness and generosity that Maggie and Tony have woven into their business. Prices here. Direct cremation £1850 all-in. Does not include: Chapel of Rest visitation; use of a traditional hearse, professional bearers or any funeral procession, attendees or service prior to the cremation. Your call will be answered by –Maggie or Tony. If you call the Corby branch you may speak to Jemma, and she will arrange a meeting with Tony for you at a time to suit you. Home Visits – Very happy to make arrangements with you either at the funeral home or at your own home. Embalming – They do not routinely embalm – in fact, they hardly ever do. They’ll recommend it if they think it necessary and, of course they’ll do it if you ask. Continuity of Care – From start to finish you will be looked after by Tony and Maggie, with Jemma providing the continuity and support at the Corby branch. Family Participation — If you’d like to come in and wash and dress the person who has died then they’ll be there for you, to help you or leave you to it. Ethnic Specialism – They are experienced in other funeral customs, particularly Jehovah’s Witness, Baha’i and Hindu. Local Celebrants – Good local celebrants to choose from, including Maggie. Outstanding retired C of E vicar. Home arranged funerals – Will gladly work with those who wish to care for their person who has died at home: see the Do It All Yourself section of the Good Funeral Guide website. Web Site – Lots of useful information plus their price list. Their charging structure is transparent and highly itemised, so you can pick and choose what you want. Prices – Definitely at the low end of the scale, representing outstandingly good value for money considering their calibre and the time they’ll give you. Parking – free on-street parking and plenty of it outside the funeral home at Finedon, and off street parking behind the premises at Corby. A thoroughly honest, decent little funeral director in a former draper’s shop in this handsome Northamptonshire village where you can create a sendoff for your loved one which will leave you proud that you did your best and got it right. The second branch, in Corby echoes the ethos and values that imbue this business – simple, thoughtful and always with the family at the heart of what they do. Plenty of room here to come in and decorate the coffin if that’s what you’d like to do. You will never be pressured to buy what you can’t afford. We really like the down to earth quality and the kindness. Low cost, high value — an extremely attractive combination. From the minute we walked in the door, we as a family felt so at ease and felt so comfortable talking about our bad experience with the death of our dad. Tony was amazing with our Mum and very caring and we as a family cant thank them enough for all the support they gave us. But most of all the send of they gave our Dad was personal and very proffecional. It felt like they made such an effort to know all about my Dad and us as a family. This made the day a little easier for us knowing he was in good hands at all times, and we had no worries or conserns with anything as Tony sorted everything out, It is a very difficult thing to lose a Dad, Husband, and Grandad and our best friend. Knowing Tony was dealing with everything we as a family could not just greive but celebrate my dads life. Its been 5 months and we popped into the shop to just thank Margaret Rose Funerals for making his Funeral a day for tears and laughter as the service was personal and went the way we had wanted it to. Thank you for everything but mostly for being a friend and being such a caring team.